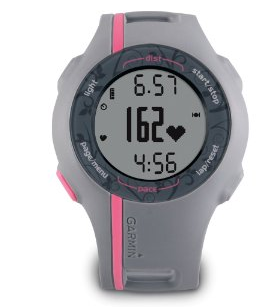 I have tried many different things to figure out my running pace -- various apps on my phone, pedometers, old-fashioned watches...but it was not until I got my Garmin GPS watch was I truly able to gauge and improve my times. A year or so ago, I was somewhat pleased with the performance of one of my apps in telling me my time, distance, pace, and all that good stuff. However, I found that often times it had my route wildly wrong, the GPS having fallen out somewhere in the middle of my run, or I found myself constantly pulling out my phone (or wrenching my arm to see) what I was doing. I needed to find a different way. I read a lot of reviews pointing me towards GPS watches, and my research landed me on the Garmin Forerunner 110. There are other models -- some more expensive, some that sync wirelessly to the computer, some that give a lot more details than this -- but this one hit had what I needed, and hit the right price point. What did I need? I wanted to know how far I was going, and how quickly I was doing it. Added bonus of this watch was compatibility with a heart rate monitor, which helped me gauge my exertion at certain points in my run so I could adjust accordingly. This was definitely not necessary. The face was large enough for me to easily see things at a quick glance while I am running, and the wristband was small enough to fit on my wrist (I have rather narrow ones). One thing I really like about this watch is that it tells me my overall pace, not the moment-to-moment. So, if I slow down at some point, it tells me how that is going to affect my time for that mile. The con to this is I often don't find out if I am running too fast until I have overexerted myself, but that is all part of the learning experience. Since starting to use this, I have found my running efficiency has definitely improved. I am rather dependent on it, but, should I forget to wear (or charge) the watch, I have been able to train myself to know what the watch might say at that point in time. I hope this one lasts me a long while, but overall, cannot recommend a GPS watch enough!